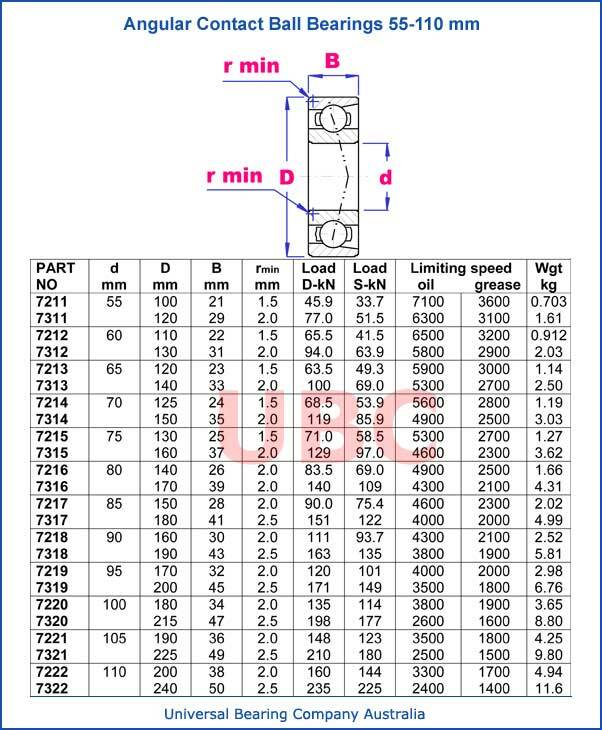 Angular Contact Ball Bearings 55-110 mm Universal Bearing Company have raceways in the inner and outer rings that are displaced with respect to each other in the direction of the bearing axis. This means that they are designed to accommodate combined loads i.e. simultaneously acting radial and axial loads. The axial load carrying capacity of angular contact ball bearings increases with increasing contact angle. The contact angle α is defined as the angle between the line joining the points of contact of the ball and the raceways in the radial plane along which the load is transmitted from one raceway to another and a line perpendicular to the bearing axis angular contact ball bearings are produced in a wide variety of designs and sizes.